Teddy is special! Just being Haplo's son makes him special but he's also special in his own right. He is such a kind, gentle, soft, loving and affectionate boy, but very playful. Like his half brother, Laszlo, he has an addiction to soft toys and has to carry them round constantly, he always greets people at the door with a toy in his mouth. 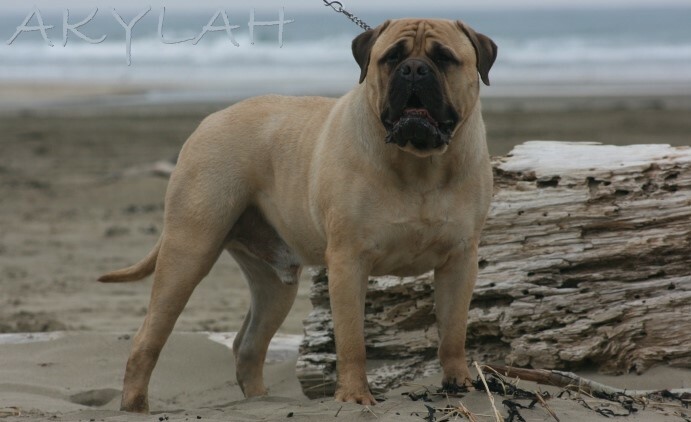 As well as having such a gentle temperament passed down from his daddy, NZ CH Bullmighty Haplo CGCF (Imp.Aust. ), he is structurally a beautiful boy. He has great substance and width, is balanced front and rear, has an excellent topline and tailset, and lovely movement. Teddy doesn't appreciate the show scene (he prefers the beach!) so he spends his days as our beloved pet, lounging round on the sofa, playing, going for walks, and making our lives brighter. Teddy has been hip and elbow scored. Hips L02/R02=4, Elbows 0/0. See below for more pictures of Teddy and for a copy of his pedigree.